Let’s hope the cycle ends this time as that was George doing that before. That and Disney said they wouldn’t be making anymore edits. 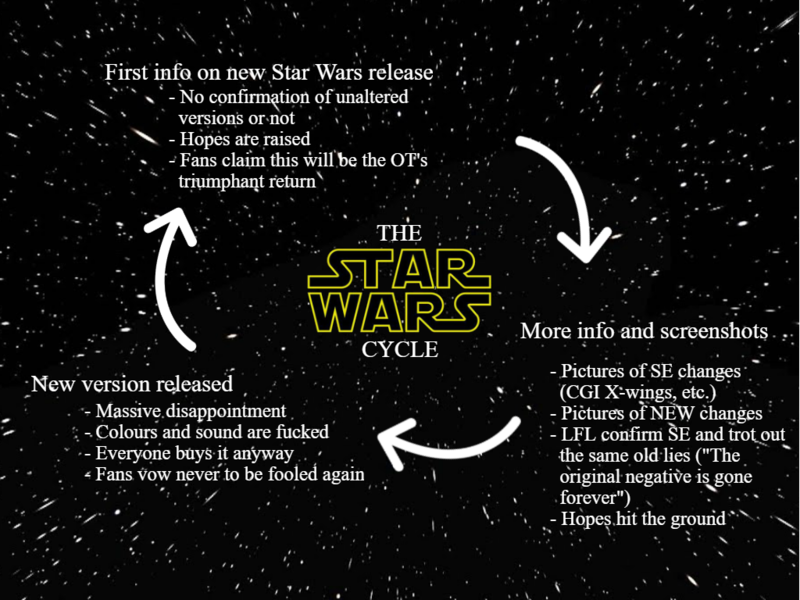 Update (22:20 on 11/04/19): Following a second conversation our contact helped clarify that Disney are working towards delivering something that will “please fans” and that the original material has come from a “variety of source … much of the original film and negative stock was in poor condition even before George worked on the Special Editions” and the restoration team sought out the “best possible version” of each scene within the LucasFilm and Fox archives. The original trilogy 4K remaster was started way back in 2014 and has been through a number of iterations as new alternative/better copies of some scenes have come to light. The print watched by Gareth Edwards has had some improvement since he viewed it but everything other than Episodes II and III has been locked in now. Let’s hope that article comes true. Meh. It says nothing about whether the OUT will be made available. That’s because an official announcement hasn’t been made and he doesn’t want to get fired or sued. There is something you need to know: there is no conspirary to hide away the OOT. If the guy doesn’t mention the OOT, it’s just because it ain’t about the OOT. If one day they release them, it will be clear and crystal. The Star Wars canon for Ep I to VI are the cuts available since 2011. I’m glad it seems they might have found a way to improve the video quality of even Ep II and III. The “will please fans” is probably all deleted scenes available in HD (like the ones showed last year with “this Sith Lord” being said during ANH officer meeting). The part about “Four discs per film for the 4k, three for the standard blu” made my heart sink a little, since that might mean they’re once again going to give the two different versions unequal treatment, with the 4k UHD only including the SE in 4k and relegating the unaltered version to 1080p. When we have actual 4k transfers of these movies made by the fans and LFL actually has the ability to do us one better with a professional cleanup from a scan of higher quality elements only they possess, it would be a real shame if they gave us the OOT only to lock it into a level of quality from 13 years ago. Deja vu, man. Again, this is assuming anything in this article isn’t total clickbait bs. The timing makes it highly suspect. That’s what he’s saying - disc 1 would be the SE in 4K, disc 2 the SE in 1080p, disc 3 the OT in 1080p, and disc 4 is extras (in 1080p). The standard BR release would just drop the 4K disc. If—IF—the OUT is coming, I don’t see them doing that. We’ve heard about how they’ve been scanning all the old elements in. They’d have no excuse, whereas with the GOUT they avoided a lot of effort by putting out the LD master. They’ll have to make a new transfer for Blu, so 4k won’t be any more work. I don’t think the GOUT was malicious. It was just lazy. It would be different if they released the OUT now. They’ve got all the elements scanned ready to go if they ever want to release it, and there’s not an existing HD master of the OUT they can just dump on Blu-Ray. Not saying they will release, just if they do, I suspect they’ll do it right. My guess is, that they will respect Lucas’ wishes by not restoring the OOT as a whole. What they might possibly do, is to release a whole bunch of restored unreleased footage at 1080p, and in those same extras include the restored OOT scenes. Honestly, I wouldn’t complain at this point. If I got a good restoration of the original trilogy in 1080p all from original film elements done right, then I’m going to be a happy camper. If that’s what this release turns out to be then I hope that people don’t boycott it based purely on that. I’m not convinced that those are exactly his wishes. Lucas is not against film restoration. Yep. Also if he truly never wanted them released again in any capacity he wouldnt have caved with the GOUT. Yes he cheated us by using LD masters but it at least shows he’s not fully against them being available. If Disney/LF made the decision to fund a restoration of the OUT and have it released, I really doubt George would care (it’s not his money). The most damning thing you can say about Lucas is that he’s opposed to the availability of certain films, and that’s a big problem and I’ve criticized him relentlessly for that over the years, but I don’t believe that he would demand the films not be restored. I won’t get my hopes up just yet because it is very possible that Disney will just continue to ignore the existence of the pre-SE versions of these films, but I will say that this seems to be, by far, the most credible rumor yet. It also lends a little more credibility to the past rumors if it’s true that they’ve been working on the restoration since 2014, which is when all the nonstop rumors started up. Oh, I’d look at such a scenario glass half full, to be sure. More than half, even. There’s a big debate in the AV community right now as to whether or not HDR is inherently revisionist for older movies anyway. I’ve even heard it argued that the dynamic range of regular sdr blu-ray is already exceeding that of the original prints of many older films as well. I’ve also heard it argued, scientifically, that 35mm film prints of movies probably never exhibited anything higher than 720p in terms of real perceivable detail anyway. The story doesn’t even change much if we go back to the camera negative. Even Robert A. Harris has argued that The Godfather films wouldn’t stand to gain much from being seen at their full 4k resolution. The counterargument, of course, is that a restrained use of HDR (or just no HDR at all) combined with the higher resolution and wider color gamut UHD affords would actually bring us closest to how the OOT originally looked in theaters. It’s also the principle of the thing. Both versions should be made available on the most recent format and not just the SE. But considering I skipped the GOUT and the 2011 blu-ray, yeah, I’d probably pick this up.